The “EVO” part of this Sym’s title is spot on. The Taiwanese built scooter started it’s life as a 250, and then evolved into the 263,7cc engine which currently provides it’s thrust. In fact parent company Sym are busy with a bit of an evolution themselves. 2018 world wide sales are significantly up, to more than 750000 units, this despite sales in China, their previous biggest market being down. 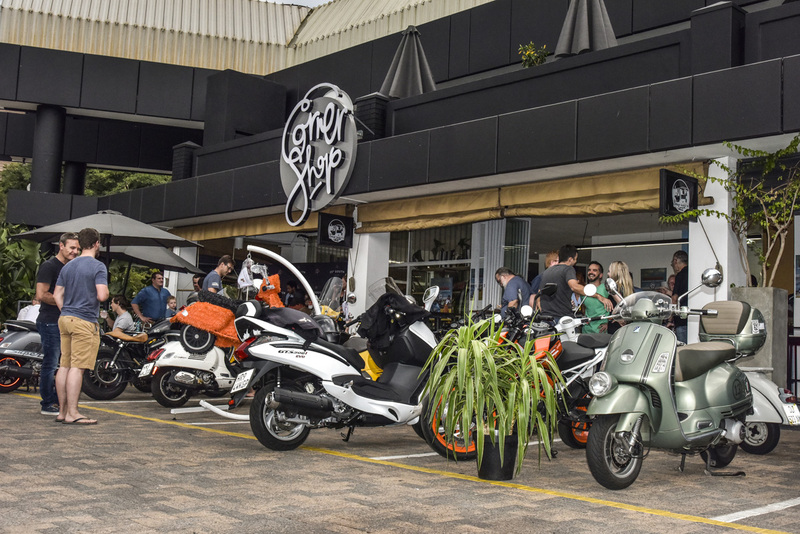 Sym products have built a reputation for quality and reliability over the years which is now starting to bear significant fruit. As always, when I review a bike I see what journos around the world have to say about the bike. This is so that I remain objective and factual and if there is an issue which I am not aware of I want to know about it. The more you google Sym, the more you read positive things about this brand. After reviewing the Citycom 300i I became a firm fan. A fan of that scoot in particular and of scooters in general. 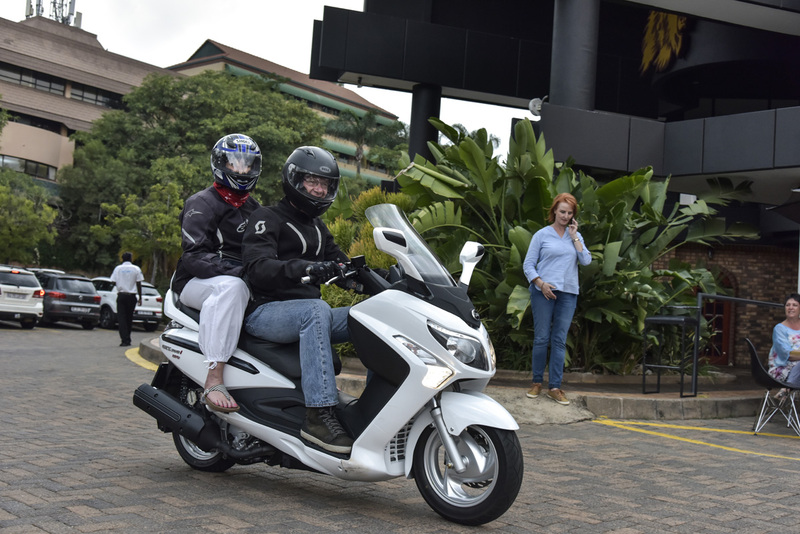 I just don’t get why SA has not followed the European love of scooters. As our roads have become more and more congested over the years we should, like in Europe, embraced this thrifty, convenient and fun way of commuting. At times I think we are just way too testosterone driven and dof when it comes to making intelligent commuting choices! By all means, keep your big beast, but don’t waste it in the urban sprawl. 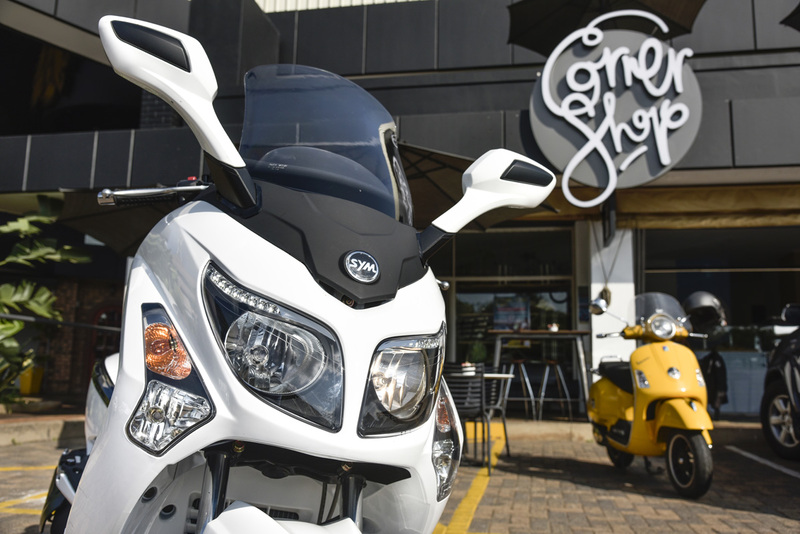 Your saving on services and tyres and petrol will damn near pay for your Scooter. The GTS EVO looks more substantial than the CityCom, with more elaborate bodywork, and despite running 13 inch wheels. I half expected a tad of instability with the smaller wheels, but no way! The GTS, aided by decently damped shocks, tracks straight and true at all speeds, even over dodgy surfaces. The body does provide a greater level of weather protection and storage nooks and crannies. 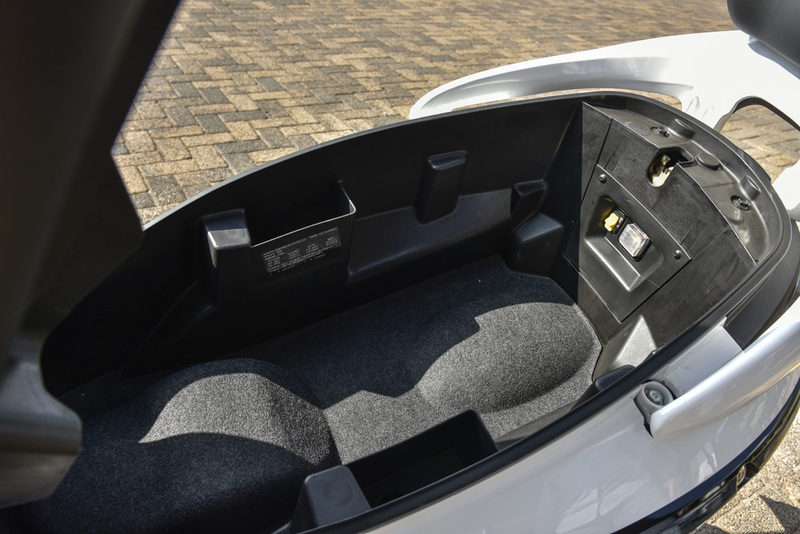 There are two cubbies just rear of the dash as well as a third behind your feet. 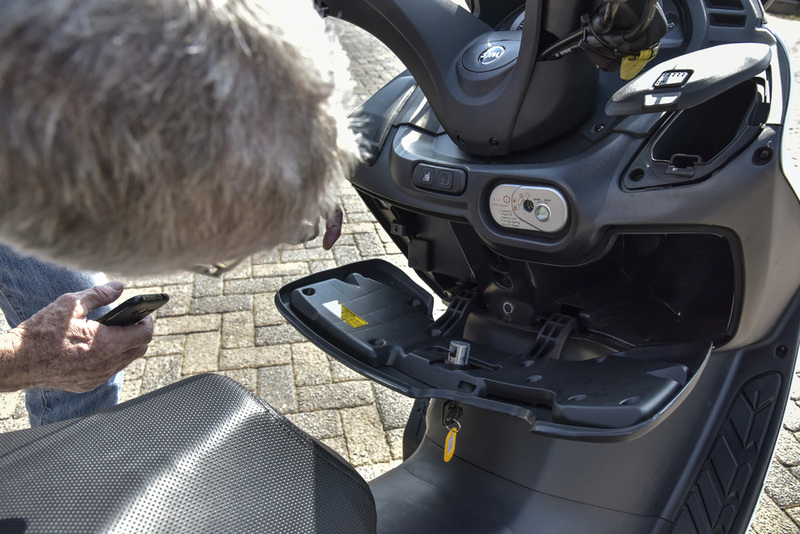 The under seat storage is comprehensive and good for two full face helmets. The EVO also features the on/off kill switch additional security measure under the seat. The steering can be locked too, as well as a sporting a cover which locks over the ignition so that you can’t jimmy the lock. Clever. The EVO is slightly heavier than the CityCom and makes slightly less power at 17.15 Kw and with torque of 24.08 Nm @5500 rpm. The result is slightly softer performance all round. That said, it is no slouch, dropping most cars off the line in the robot GP’s. I took it on an evening out at the Corner Shop with my wife Irene on the pillion. She loved it! Reckon’s it rivals the very best she has experienced for comfort. The urge makes two up riding a doddle too. It was so convenient stashing our kit under the seat while we quaffed an ice cream and coffee. I used the GTS for a full week in the course of my daily comings and goings and enjoyed it so much it was a real wrench to give it back. I rode out almost two tanks of gas which, at 28 km/L gave me 300 plus k’s on a tank. Frikken amazing. Now here is the thing. It is a given that the EVO GTS is going to be the business in the general urban sprawl. 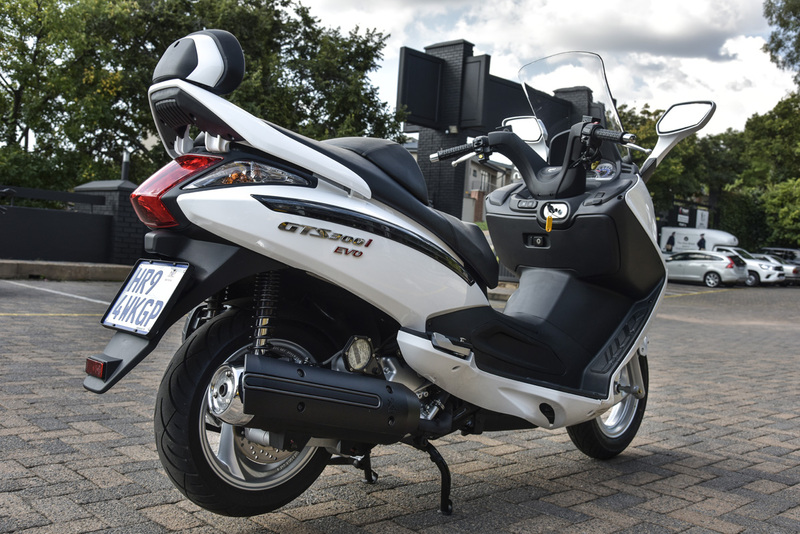 What you don’t expect, considering it’s bulk and a motor of closer to 250 than 300cc’s, is how well it performs on the highway. The torque is such that it holds it’s speed, and even accelerates if called upon to do so, whilst cruising at highway speeds. 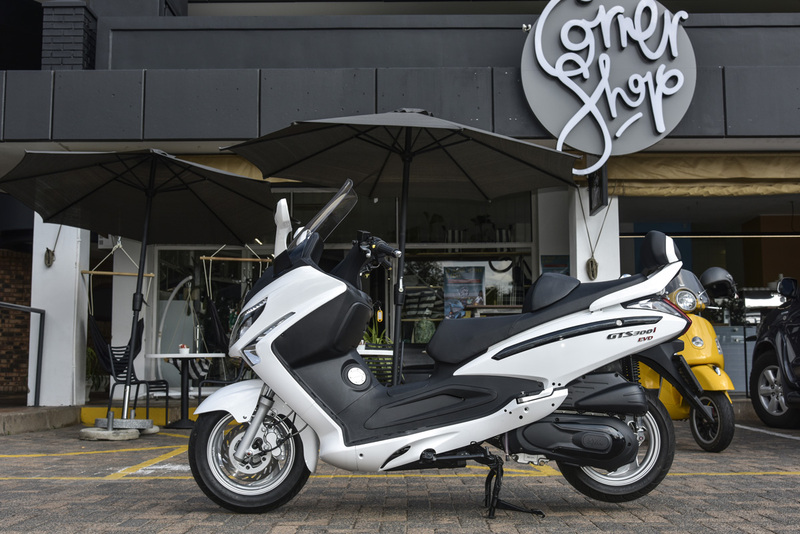 I reckon that if you like touring at a “stop and smell the roses” pace, the Sym 300 Scooters would do the job in a really practical way. 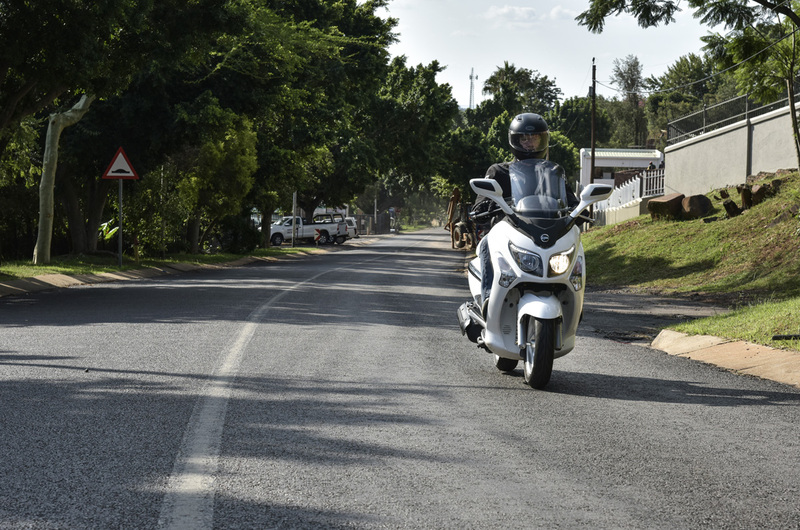 Good wind and weather protection, a smooth [at all speeds] motor, decent tank size and brilliant fuel economy. Ally those attributes to a comfy seat with nice lower back support and you have in my book, a winner. 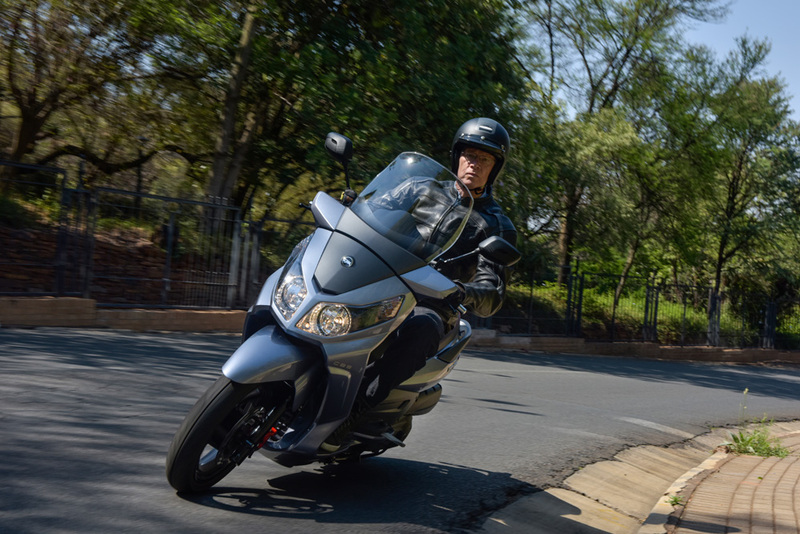 The Sym 300 GTS EVO, at a little over R60 grand, makes a compelling commuting argument. I just feel that to not explore it’s other talents is to sell it short. Over the coming Easter weekend we are going to indulge in some Botswana SYMmetry. Two Dave’s, are going to ride two 300 Sym’s, to Elephant Sands in Botswana. We intend carrying all our camping kit in and on the scooters. We’re going to prove to any remaining sceptics out there just how good, versatile, economical and fun these amazing scooters are. Watch this space!